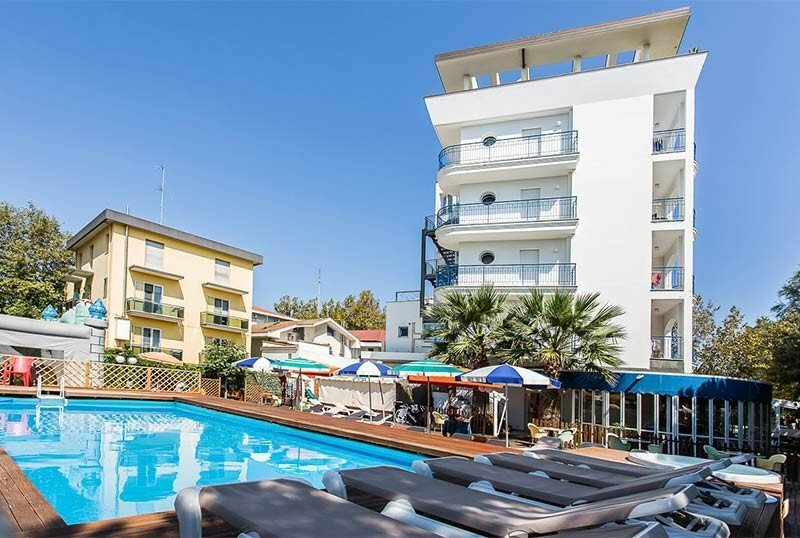 Hotel Lido Europa, 3 stars in Riccione, near the beach and with sea view, with many facilities for families and children, including a large swimming pool surrounded by a green area equipped with solarium, mini pool for children, hydromassage, playground , entertainment and miniclub. Also available: parking, free use of bicycles, room service and agreements with the nearby Terme di Riccione. Pets Allowed. In the area of the new promenade, just a few steps from the beach, the hotel enjoys a beautiful sea view. From the hotel you can easily reach Viale Ceccarini, a meeting point for shopping and entertainment, and the Aquafan and Oltremare parks. Spacious, well furnished and full of comfort, all rooms have a panoramic balcony, air conditioning, heating, LED TV with USB and digital terrestrial, WI-FI, mini-fridge, safe, private bathroom with hairdryer and shower. COMFORT: located in the nearby depandace, are sober and modern, for 2 people with the possibility of adding a third bed or cot for children, or for 4 people with a double bed and a bunk bed, with a 22 '' TV. SUPERIOR: modern and spacious, for 3-4 people, with double bed and bunk bed (or cot on request), balcony with sea view on request, TV 26 ''. FAMILY ROOM: spacious, ideal for the whole family, can accommodate up to 5 people, have a small equipped kitchen. Also: TV 32 '', breakfast in the room on request, courtesy set for bath and beach, welcome fruit basket, newspaper and video library of cartoons in the room, parking in the garage. Room facilities for the disabled are available on request. Swimming pool with Jacuzzi and bar, large common rooms, reading room, bicycles available for adults and children, elevator, beach towel, newspapers, laundry (on payment, on request). PARKING: garage and outdoor parking on request. AIR CONDITIONING: in the hotel and in the room. CONVENTIONS: beach, spa, swimming pool, amusement parks. Organized excursions on request. SERVICES FOR PEOPLE WITH DISABILITIES: entrance located on the first floor with a sloped ramp, a standard elevator, room with wheelchair maneuvering space and aids, a wheelchair access shower, a shower chair. Two, the equipped rooms. PETS: on request, admitted of all sizes. BREAKFAST: rich sweet and savory buffet, with homemade cakes and coffee products. LUNCH AND DINNER: wide choice of dishes and specialties from Romagna, with great attention also for children. At lunch and dinner 3 menus of meat and fish, buffet of appetizers, vegetables and side dishes. VARIATIONS: on request kitchen for celiacs and vegetarians. In hotel: dedicated pool with rescue service, welcome gift, baby / mini / junior club, entertainment with theme nights, parties, shows, playground with video library and library, outdoor playground area with bouncy castle, bicycles with child seats, strollers available. On request: baby sitter and pediatrician laundry service. At mealtimes: flexible mealtimes (12:30 - 14:00 and 19:00 - 20:30), table seats, baby menus, baby food, baby food, mini tableware and table mats, color and game, and mothers' kitchenette with refrigerator, plates, microwaves, bottle warmers, high chairs, cutlery for children, plastic dishes and placemats to color. At the beach: live entertainment, baby dance, theme parties. Area surrounded by greenery, main pool 12 mx 6 with depth 130 cm, hydromassage, solarium area with beach umbrella and 40 sun loungers. Mini pool for children with a maximum height of 60 cm, games, inflatables and rescue service. The hotel has an agreement with the Baths 46 and 47. There are hot tubs and a gym, a playground area for children, sports fields and relaxation areas. From 01 to 08 June 2019, Full board from € 45.00 per person per day and 2 children up to 10 years FREE! Last Week of July all included without surprises! With our Full All Inclusive package, you won't have to think about anything anymore!